PLA grab dredger LONG REACH entering Tilbury docks. Built in 1961. A familiar sight in the river and in Tilbury Docks, the grab hopper dredger LONG REACH (built at Paisley, Glasgow; 1972 tons gross) joined the Port of London Authority fleet in 1961. 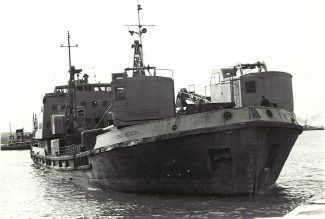 It surprisingly lasted only 13 years in the port of London and in 1974 was sold to an Italian firm for service at Genoa under the name ANNA D. It was broken up at Aliaga, Turkey, in 2001.